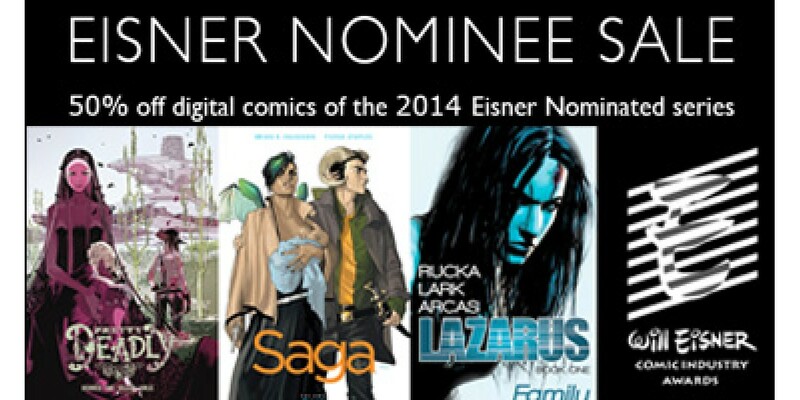 In celebration of the 2014 Eisner Nominees, Image Comics is proud to present a limited time sale on digital editions of all ten of the titles nominated, offering all issues at 50% off on all available platforms. Whether you get your digital comics DRM-free on our website or via ComiXology, Google Play, Amazon Kindle, or Apple iBooks, you’ll have no excuse but to check out the series that fans, critics, and industry professionals can’t stop raving about! The sale begins on the Image Comics Website immediately, and on ComiXology, Google Play, Amazon, and Apple iBooks beginning 4/16 and ends at midnight EST on April 21, 2014.